Beginner’s Guide to Photoshop: One-Stop Cheatsheet #infographic ~ Visualistan '+g+"
As a newbie to Photoshop, using the software can be quite daunting. You know its immense possibilities, you’ve devoured books on graphic design, but when you’re actually faced with your first Photoshop job, the excitement quickly evaporates as you struggle to understand the commands and complete even the tiniest task. Don’t sweat! 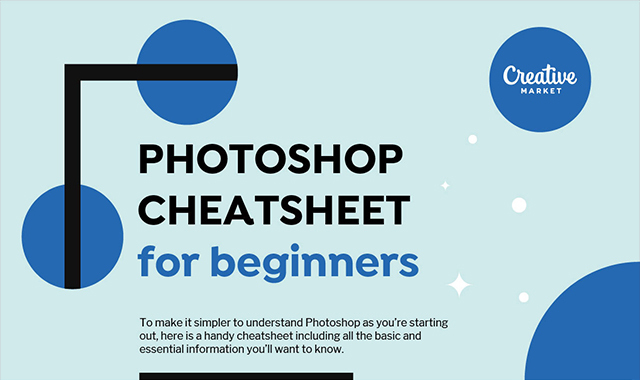 Here’s the ultimate cheat-sheet for Photoshop beginners – it gives you all the essential how-to information in one place – how to layer, how to zoom in, how to set colors, how to customize your workspace, etc. Pin it – it will be a huge help in the initial stages.